Born in Toronto, Ontario on October 5, 1916, Roy Conacher and his twin brother Bert were the youngest of five boys in a family that also included Hall of Famers Charlie and Lionel. There were also five girls, creating a very competitive spirit in an extremely hectic household. As youngsters, Roy and Bert were inseparable and surprisingly enough Roy was more interested in softball than hockey. Inevitably Roy and Bert quickly took to the family sport. At the age of 16, Bert was accidentally hit in the eye during a street hockey game by older brother Charlie and lost sight in one eye, thus ending his professional aspirations. Roy went on to play for Jesse Ketchum school in Toronto, later joining the Marlboro Bantams and Midgets. During the 1935-36 season, Roy starred with the West Toronto Nationals that captured the Memorial Cup championship. The following year, he was an All-Star with the O.H.A. Senior champion, Dominion Breweries. After one more season of senior hockey in the Northern Ontario loop, Roy was invited to the Boston Bruins training camp at the age of 22. With his name preceding him, expectations were high for possibly the most naturally talented of the hockey playing Conachers. During the 1938-39 NHL season, Roy led the NHL with 26 goals and was runner-up to teammate Frank Brimsek as rookie-of-the-year. This pace continued during the playoffs, as Roy scored six goals, including the Stanley Cup winner versus the Toronto Maple Leafs. Over the next three seasons, he led the Bruins along with linemate and Hall of Famer Bill Cowley. Roy was one of the NHL's leading scorers during the 1939-40 season until breaking his wrist and missing 16 games. The following season Roy helped Cowley capture the league scoring title and the Bruins won another Stanley Cup. With World War II now in full swing, Roy played one more season before joining the Royal Canadian Air Force, forcing him to miss the next four seasons of action while in his prime. After an honourable discharge in 1946, he joined the Bruins for the stretch run. However, General Manager and Coach Art Ross, thought it impossible for a player to return to the NHL after a four year absence and play at the same level. So, Roy was traded to the Detroit Red Wings and picked up where he left off, leading the Red Wings in scoring with 30 goals. Art Ross, when later asked what his biggest mistake as a coach and general manager was, replied, "Trading Roy Conacher." The following season he was traded to the archrival Chicago Blackhawks, where he continued the rapid pace. With brother Charlie at the helm as coach, Roy would lead the NHL in scoring during the 1948-49 season with 68 points and was named to the First All-Star Team, despite playing for a last place club. This historical moment meant Charlie and Roy were the only brother combination in NHL history to win the Art Ross Trophy as leading scorer. 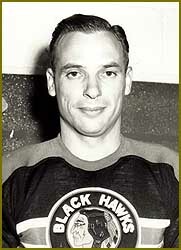 Roy would play three final NHL seasons before retiring due to injuries in 1952. He played in the All-Star game in 1950 and was named to the team in 1952, but couldn't play, again due to injuries. Roy finished his outstanding career with 226 goals, one more than his older brother Charlie. After his retirement, Roy returned to Midland, Ontario and coached the Midland Red Wings, twice winning the Ontario Junior "C" championship. Roy continued in hockey, playing in old-timer/charity games and along with his wife Fran, had three children, Roy Jr., Mark and Candace. Roy moved to British Columbia before he passed away in 1984.